Heavy favorite Almond Eye landed the last leg of the Three-Year-Old Fillies’ Triple, the Shuka Sho to become the fifth Triple Crown winner in JRA history after previously claiming both the Oka Sho (Japanese 1000 Guineas) and the Yushun Himba (Japanese Oaks) earlier in the season—previous Triple Crown fillies were Mejiro Ramonu (1986), Still in Love (2003), Apapane (2010) and Gentildonna (2012). Almond Eye was runner-up in her two-year-old career debut, won her only other start that year and kicked off her three-year-old campaign with her first grade-race victory in the Shinzan Kinen (G3) followed by her three consecutive G1 victories in the fillies’ G1 triple. Her career record stands at five wins out of six career starts. Trainer Sakae Kunieda became the winner of a Triple Crown filly for the second time after Apapane in 2010 and his JRA-G1 titles totals 14 with the Shuka Sho win. Jockey Christophe Lemaire collected his 18th JRA-G1 title—his last G1 victory was with Mozu Ascot in the Yasuda Kinen this year. Almond Eye was restless before the start and didn’t break too sharply but her rider, Christophe Lemaire, kept his cool and patiently rated her a little further back in mid-field around tenth position. The first 1,000 meter was timed at a slower than moderate 59.6 seconds, allowing pacesetter Mikki Charm to maintain a clear lead through most of the way and still have plenty left for the stretch run while Almond Eye, unable to find herself behind a wall of horses turning for home, had to circle wide into the turn. It appeared as though Mikki Charm was a sure winner with a lead of two to three lengths from the rest of the field at the furlong pole. However, Almond Eye came flying along the outside past her foes and finally the leader in the last 50 meters, and continued to pull away to a 1-1/2-length victory. “I was a bit worried today because Almond Eye was rather nervous and highly strung than usual, so the start wasn’t that good, then our path was blocked and we had to go wide, but from there she just showed just how exceptional she was. She’s such a fantastic filly and I have to give credit to the trainer and stable staff because it’s so difficult to maintain a horse’s condition at the top of her form throughout the season. So becoming a Triple Crown winner isn’t easy even with the best horse,” commented Christophe Lemaire. Mikki Charm, while succumbing to Almond Eye in the closing stages, still managed to maintain her advantage over the rest of the field for second. Rose Stakes winner Cantabile was rated just off the rails, kept close behind the eventual winner and exerted her late charge as Almond Eye made her attack but unable to match the winner’s stride while just short of reaching Mikki Charm for third. 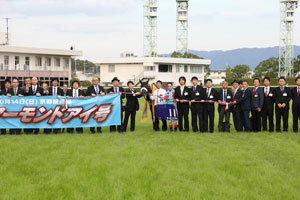 S. Kunieda Silk Racing Co., Ltd.
M. Ikezoe Silk Racing Co., Ltd.
T. Takano Shadai Race Horse Co., Ltd.
K. Nakatake Kobayashi Eiichi Holdings LLC. T. Kimura Silk Racing Co., Ltd.
M. Matsunaga Sunday Racing Co., Ltd.
Y. Yahagi Satomi Horse Company Co., Ltd.
N. Sugai G1 Racing Co., Ltd. The Shuka Sho, established in 1996, is run over 2,000 meters at Kyoto Racecourse and the third leg of the fillies’ Triple Crown reserved for the season’s three-year-old fillies following the Oka Sho (Japanese 1000 Guineas, G1, 1,600m) and the Yushun Himba (Japanese Oaks, G1, 2,400m). The Queen Elizabeth II Cup (G1, 2,200m) was formally regarded as the third leg of the fillies’ Triple Crown until the race was opened to older fillies and mares; hence the Shuka Sho was established to take its place. 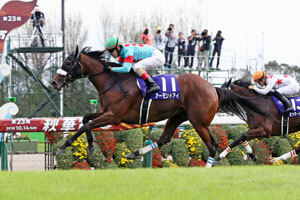 Acquiring international G1 status in 2009, the Shuka Sho is open to a maximum of nine foreign runners. Gentildonna (JPN, by Deep Impact) became only the fourth filly in JRA history to claim the fillies’ Triple Crown title after Mejiro Ramonu (JPN, by Mogami; 1986), Still in Love (JPN, by Sunday Silence; 2003) and Apapane (JPN, by King Kamehameha; 2010),and proceeded to achieve greater accomplishment within her three-year-old season by winning the Japan Cup (G1, 2,400m) against a powerful field which contributed to earning the season’s highest honor of JRA’s Horse of the Year award in 2012. Almond Eye, winner of the Oka Sho-Yushun Himba made her bid to become JRA’s fifth filly to win all three of the fillies’ Triple Crown in her first-up run of her fall campaign. The race was also the first start of the fall for 2017 Best Two-Year-Old Filly Lucky Lilac. Deep Impact fillies, Cantabile, Salacia and Lathyros, dominated the top three places in the Rose Stakes (G2, 1,800m), one of the Shuka Sho trials held on September 16. Normcore (JPN, by Harbinger), Mau Lea (JPN, by Deep Impact) and Randonnee also qualified for the Shuka Sho, finishing first, second and third, respectively, in the Shion Stakes (G3, 2,000m) held on September 8 but the top two did not turn in their entry to start in the last leg of the fillies’ G1. The field also included Primo Scene who came off a victory against older horses in the Sekiya Kinen (G3, 1,600m; Aug.12). Mikki Charm came off a three-race winning streak for her first grade-race challenge. The race record was renewed by Mikki Queen (JPN, by Deep Impact) who claimed her second three-year-old fillies’ G1 title in the 2015 edition of this race following the Yushun Himba while covering the 2,000-meter distance in 1:56.9.